On October 31 (halloween! 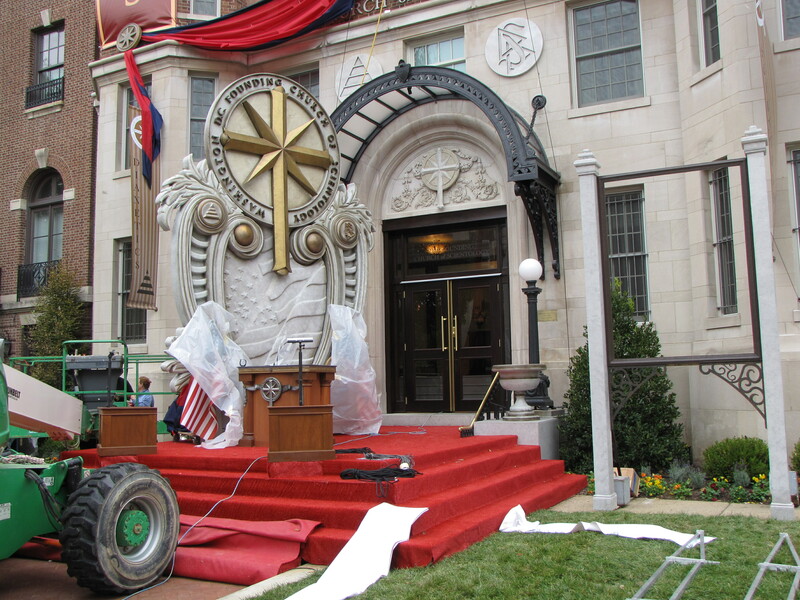 ), the Church of Scientology opened their new Washington DC “Ideal Org” at the corner of 16th and P Streets NW – coincidentally, right next door to the building where I work. 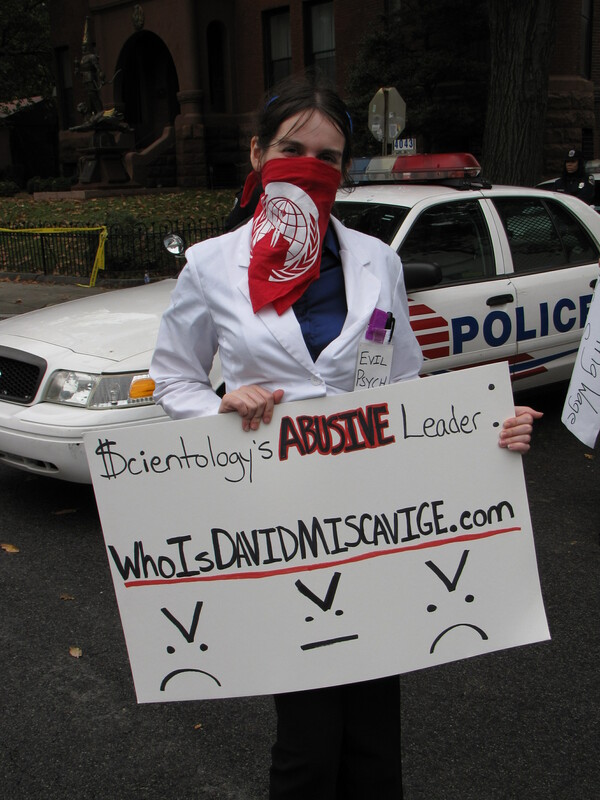 And as is the case with any big Scientology event these days, Anonymous was there. Particularly so when Scientology CEO David Miscavige was expected to be present. 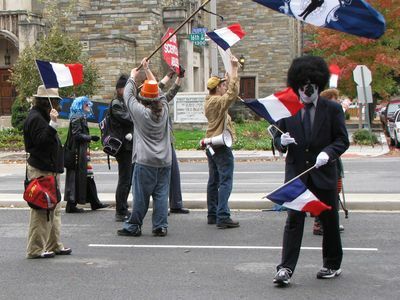 For this occasion, Anons from Boston and New York also came and joined our raid. The raid was planned to last eight hours. We started at the Ideal Org, and planned to raid there from 12 noon to 5:00. Then the plan was to move to the Founding Org until 8 PM. I arrived on scene around 12:30. Nothing, however, prepared me for the scene that would greet me when I arrived. 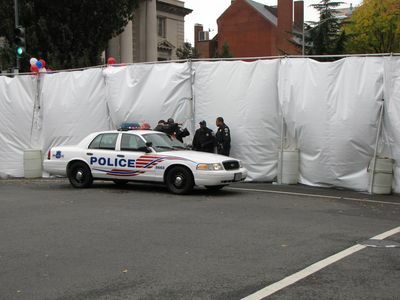 The entire 1600 block of P Street was swarming with activity, and large white tarps blocked the view of 16th Street from the public. 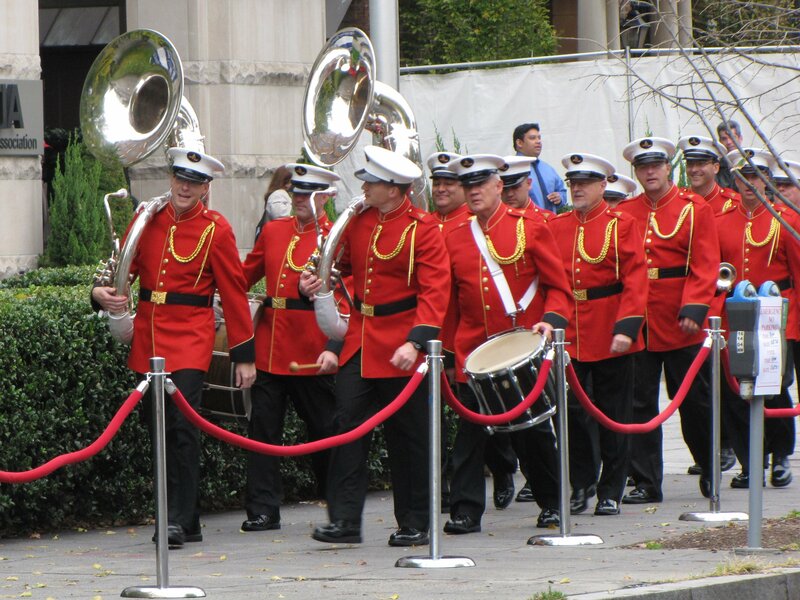 The cops were out in force, too, to attempt to maintain order throughout the whole affair. I met the Anons right in front of the entrance to my office building, 1616 P Street NW. I also met up with MPDC Commander James Crane, whom I’ve encountered at other non-Anon protests. Now it was time to size up the situation and determine what was going on. 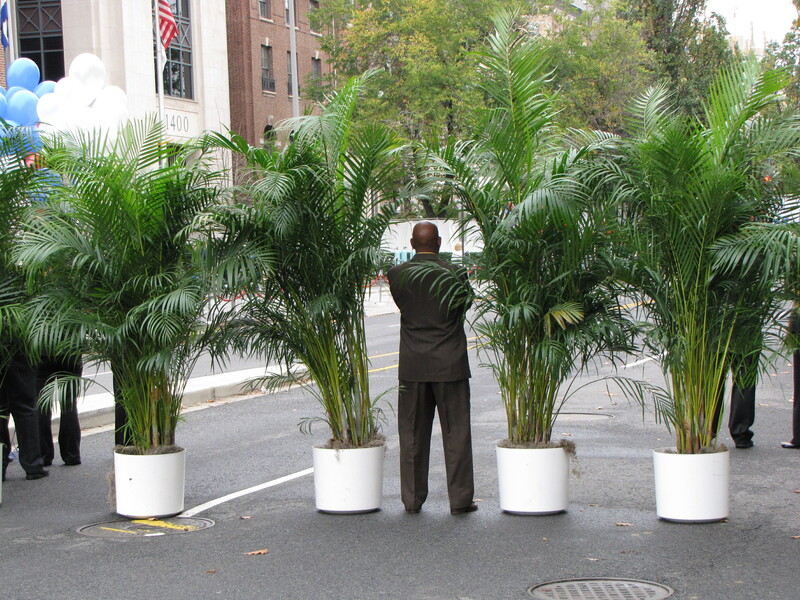 In speaking with Crane, we soon learned that we would not be allowed in the closed section of 16th Street at all, including on the sidewalk in front of the Carnegie Institution. 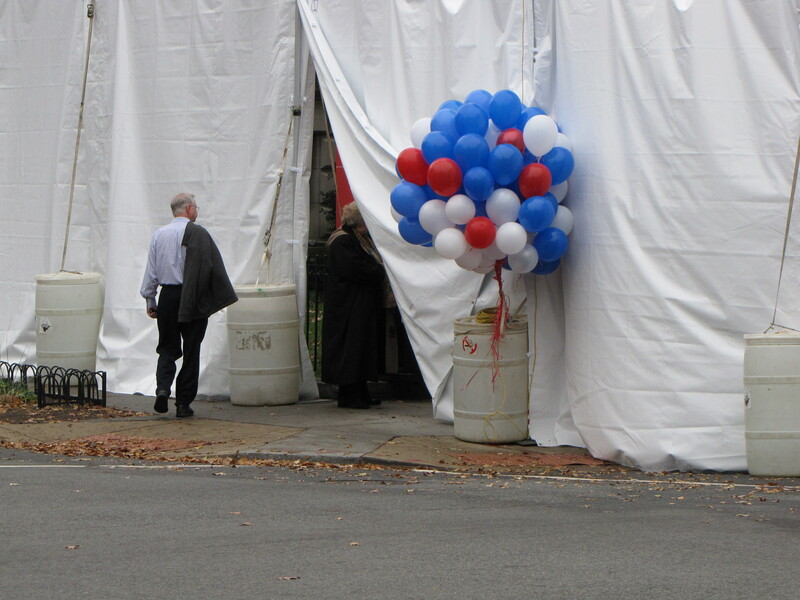 Additionally, we were not permitted to demonstrate on the same side of P Street as the tarps. We also had to be quiet, so as not to disturb the “religious service”, and if we made a lot of noise, we would be pushed back a block. However, when one questions whether the target of the demonstration is even a religion at all (and more aptly described as a for-profit enterprise), that last part came off as almost amusing. Lastly, Crane offered to assist us across the street, momentarily stopping traffic so that we could cross. 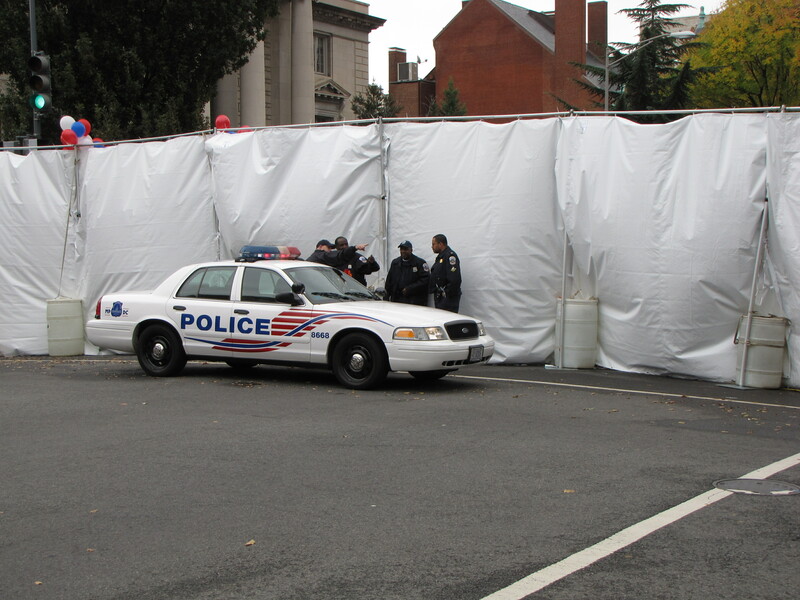 Giant tarps across 16th Street, which we described as “Curtain Tech 2.5”. 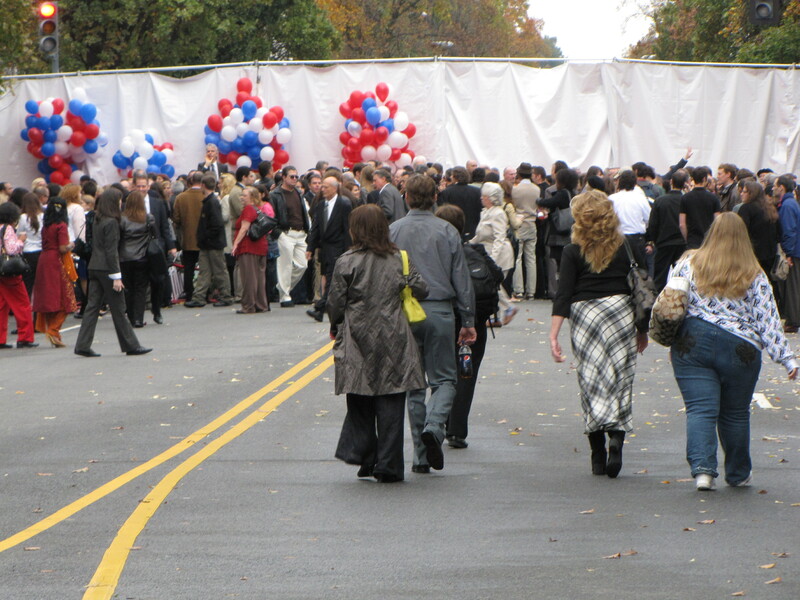 Opening in the tarps that Scientologists used to enter the ceremony from P Street. Standing in the opening is a Scientologist who harrassed me the day before while I was photographing the whole setup on my lunch hour at work (more on that later). 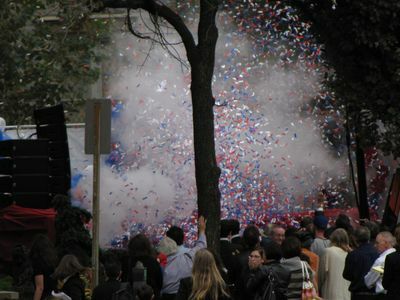 A few Anons went west and around the block to see how the other side of the event looked. As it turned out, the O Street side was completely open. No curtain tech to speak of on O Street. Once we learned of that, a bunch of us went around to the other side. Yes, it really was wide open. On the other side, the police let us take the entire northbound side of 16th Street (southbound was being used for emergency vehicles), but would not let us go beyond the south side of O Street, and if we made a lot of noise, we would be moved all the way back to Scott Circle. 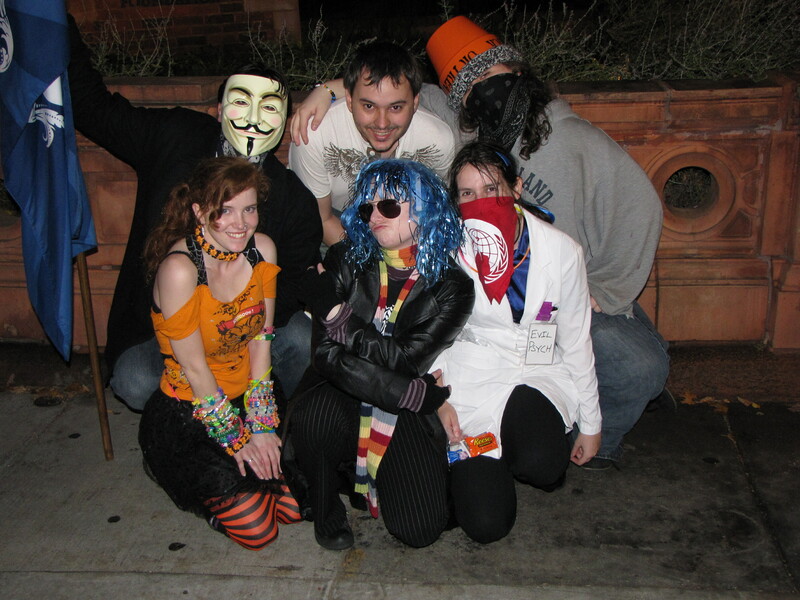 Once we realized that O Street was the place to be, we called the rest of the Anons over for backup. The Scientologists then prepared to visually block us from their dear leader, David Miscavige, aka “Slappy”, as Mark Bunker so aptly named him. 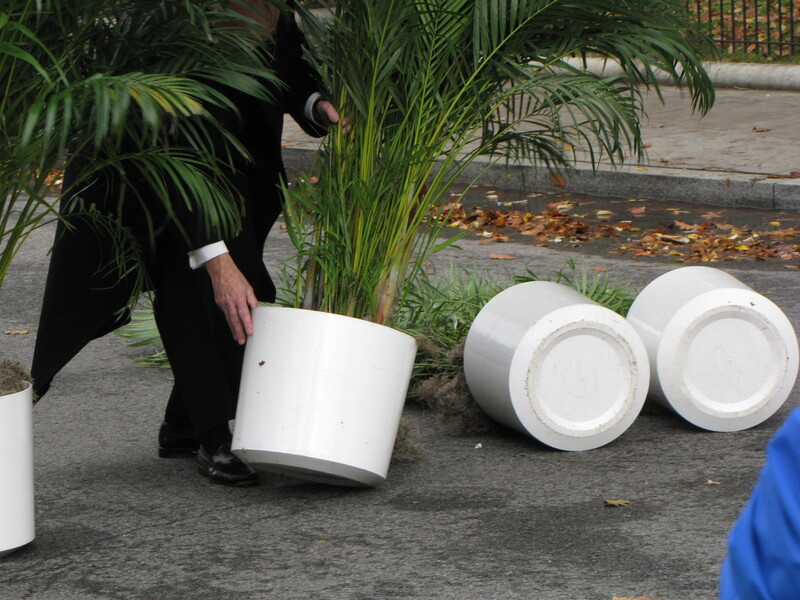 For this, they dragged large potted palms out in the street, in what we quickly dubbed “Plant Tech”. Plant tech is in effect! The wind, however, thwarted plant tech, as the palms were prone to blowing over, and did. Heaven forbid that Slappy see that people disagree with his cult’s practices! 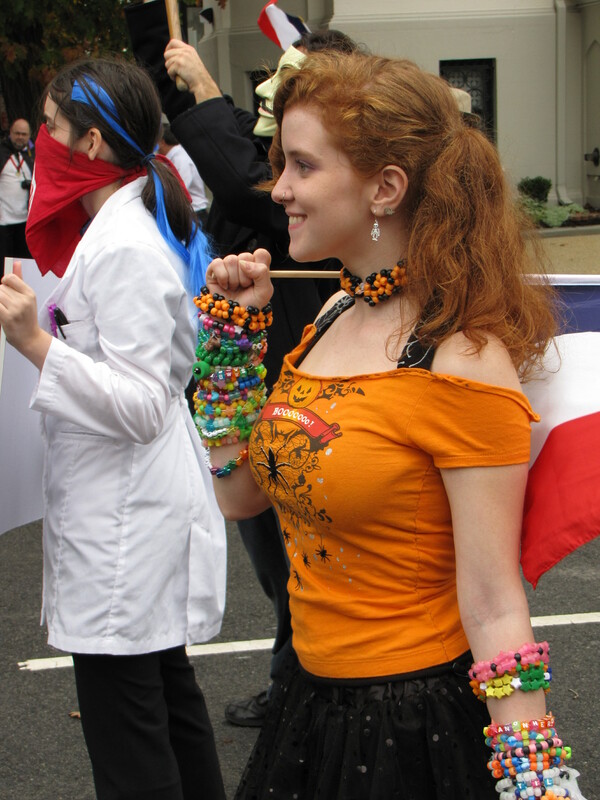 The French flags, by the way, are in light of Scientology’s recent conviction for fraud in France, where they were fined more than €600,000. Purple Hair Anon had perhaps the best costume, with her “Xenu Baby Mama” outfit, complete with two alien babies. Eventually, everyone moved back over to P Street, as Scientology started to take down the tarps and prepare for the reopening of 16th Street. 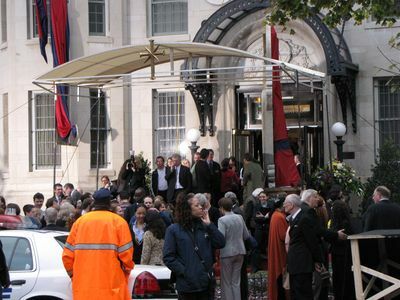 The scene in front of the Ideal Org following the removal of the tarps. Slappy had already retreated inside the Ideal Org by now. Ever get the feeling that The Simpsons got their parody of Scientology spot on with the Movementarians? 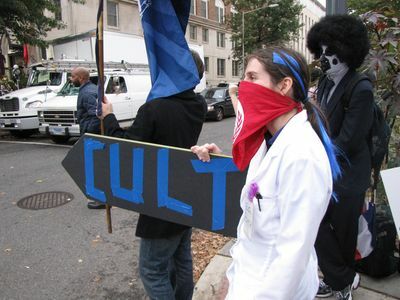 An Anon holds a sign that says “CULT” and points it at the Ideal Org. For the record, many of the residents of this end of Dupont Circle that we spoke to are embarrassed for the neighborhood that Scientology has moved in. One of the NYC Anons who was totally “out” about Anonymous, as I am (and who has received two cease-and-desist letters – I’m jealous! 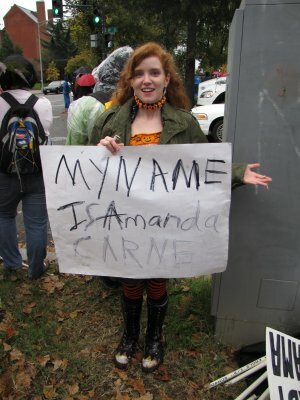 ), made a sign featuring her real-life name on it. I loved it, because it shows that we don’t fear Scientology. 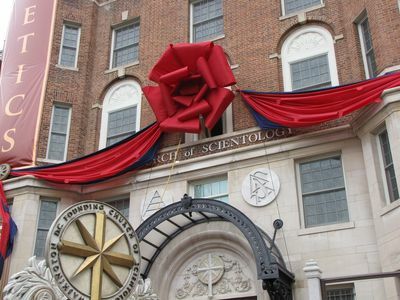 Scientology should fear us – and they do, based on the tarps and plant tech that they employed for their opening. 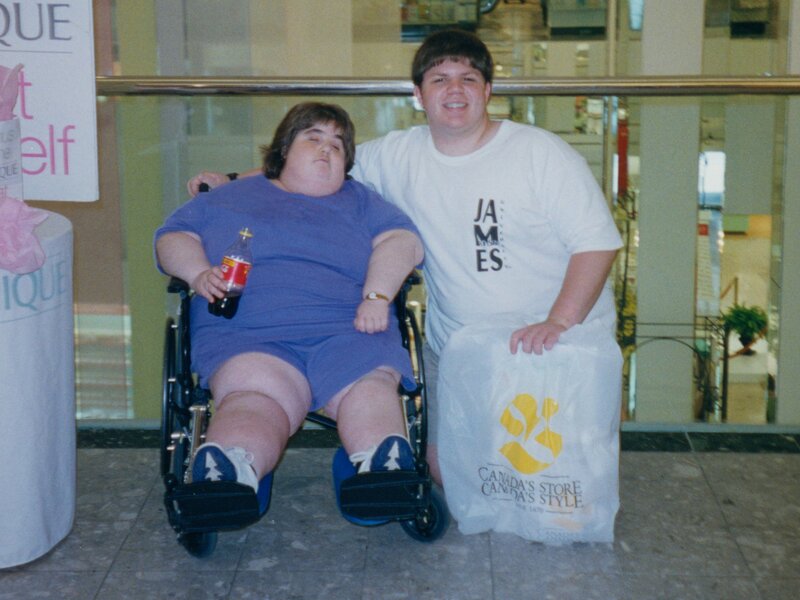 Compare to the photo of the opening of the Founding Org. No tarps to be found, but in just about every photo I’ve seen of the Ideal opening, the huge tarps were visible. 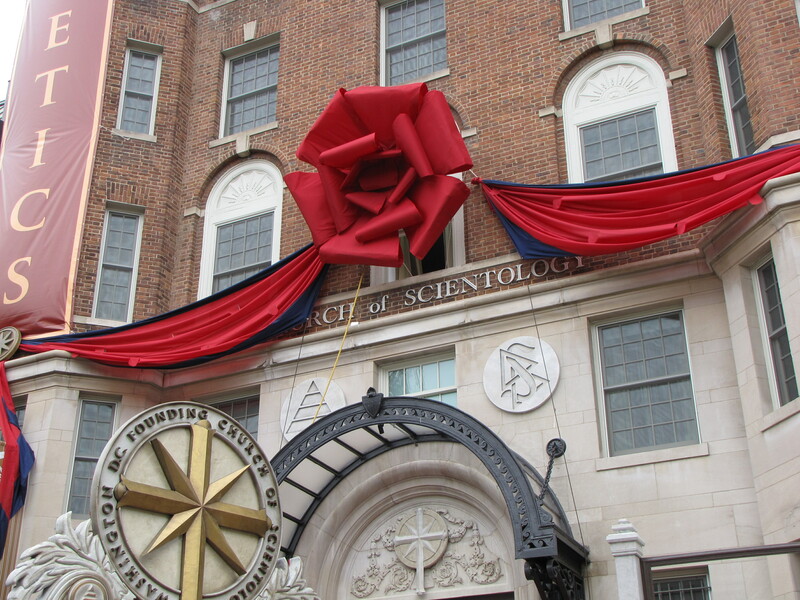 Note the giant bow and ribbon hanging from the building, and the extra-short podium for Miscavige. Let’s talk cheesy, folks. This same crazy lady also played the victim and called the cops on Sparrow early Saturday morning. I remember Sylvia trying that same tactic one time with Sparrow. 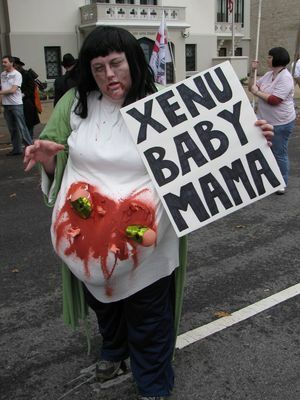 Must be something that Scientologists in OSA pay the big bucks to learn. Then just after 5:00, we made the trek over to the Founding Org. 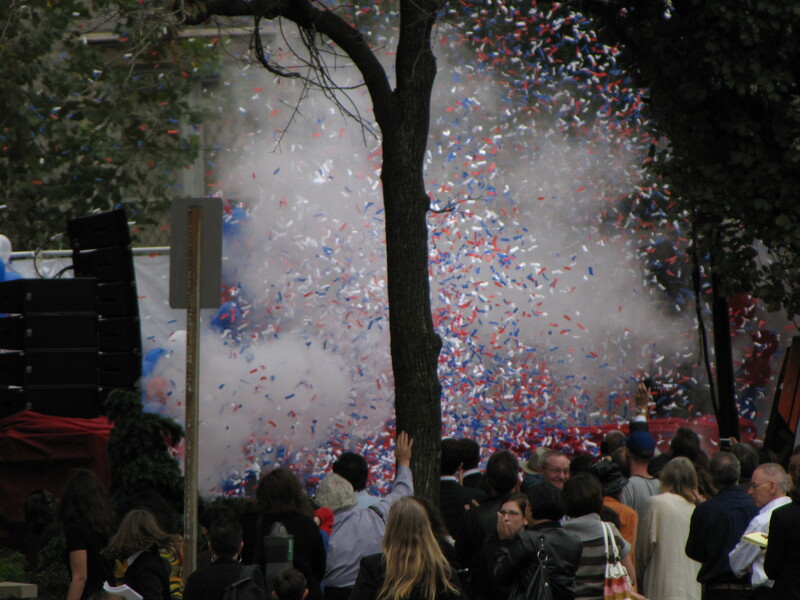 That place was hopping, too, and to our surprise, Curtain Tech was not in effect! Everyone in the main lobby of the Founding Org could see us out on the street, because they didn’t bother to hang the curtain over the door this time. The raid at the Founding Org was pretty typical of our DC raids, setting up on the triangle, as well as the sidewalk directly in front of the entrance. Raiding at the entrance. The chanting is unusual for DC Anon, as we usually put far more effort into education and distributing literature than chanting. Some of the Boston and NYC Anons pose for a photo in front of the Founding Org. 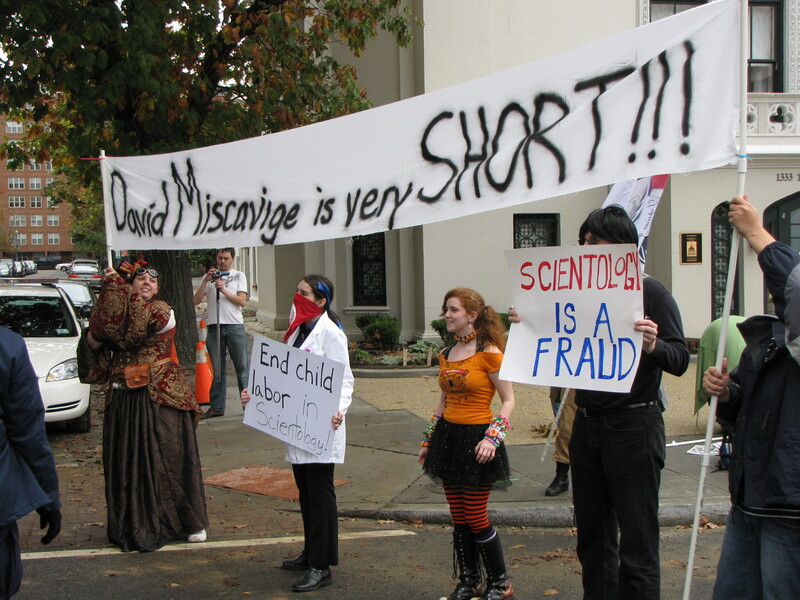 Demonstrating exactly how short David Miscavige is. He’s actually not quite that short, but he definitely fits the mold of “little tyrant”. And then at 8:00, we packed up, and headed out for dinner. We had quite a lot of fun, and definitely made sure that the opening of Scientology’s “Ideal Org” was anything but ideal. 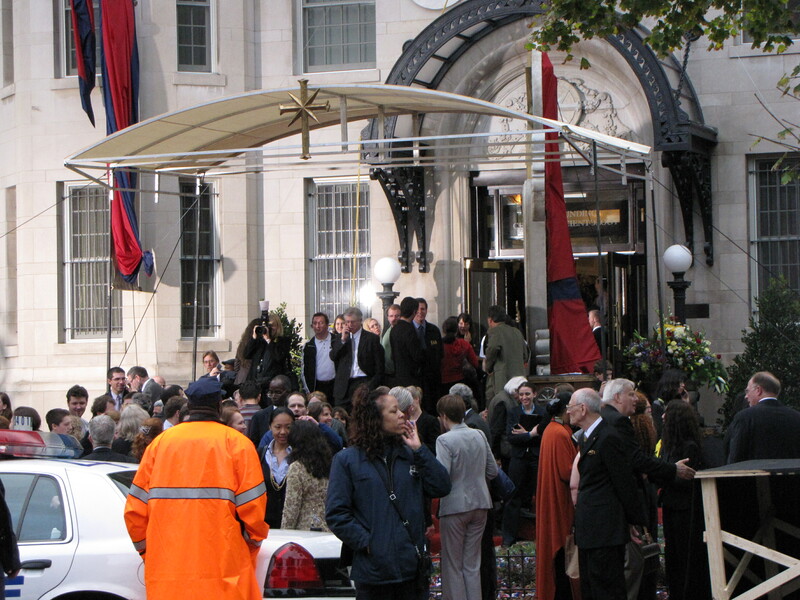 Web site: A Scientologist's perspective on the DC event, highly critical of Scientology's handling of the event. I think it validates Anonymous's strategy, and helps demonstrate that it's not the religion that's necessarily the problem - it's the organization that promotes said religion that's the problem. And yes, the curtain tech did make them look like a joke. 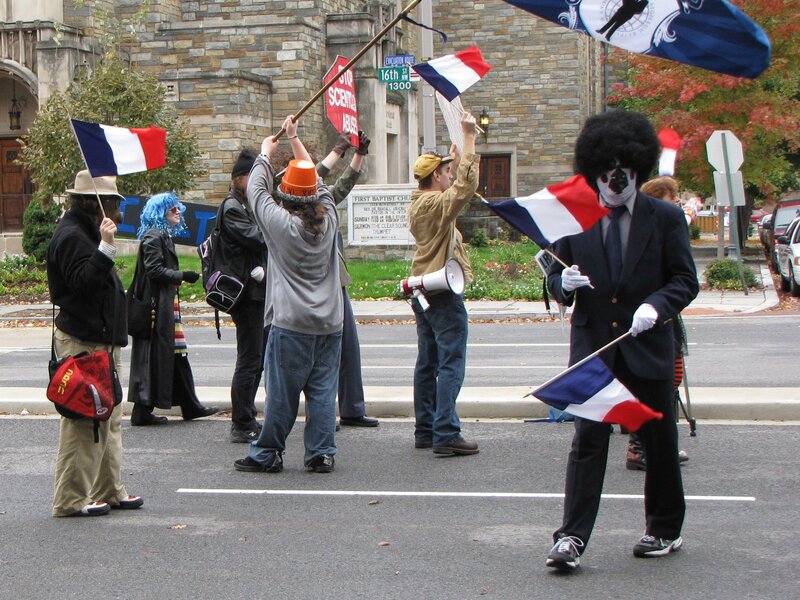 Quote: Meanwhile, the funny thing about this raid was that very few DC Anons actually wore masks, Guy Fawkes or otherwise. I didn't, and quite a few others who normally wear masks didn't. Me, I had too much else going on to worry about it. Others, who knows.